Independence supporters are often accused of seeing independence as a panacea for all Scotland’s ills. We are characterised as thinking that if Scotland could JUST become independent, everything would be fine – there’d be no child poverty, no one would be obese, no one would die of heart disease, and no “difficult decisions” would ever have to be made. Now, most of you reading this will know fine well that this is not true. 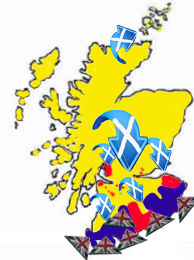 Some will see independence as returning Scotland to sovereign statehood, restoring (and, in some cases, gifting for the first time) the powers of a normal country, allowing us to make our own decisions about our future, and tailoring them for our own specific problems. Others will see independence as merely a necessary step towards being the kind of country most of us think Scotland should, can and will be. Others yet may simply see it as the only way of protecting us from the politically-motivated “reforms” taking place in the rest of the UK, the final steps of a neo-liberal right-wing social engineering experiment that has been ongoing – totally uninterrupted – for 33 years. If we’re trying to be completely honest here, we might as well admit that, yes, going by the only speech at the Rally For Independence which made me cringe (although it was so far down the running order that, mercifully, all the reporters had already gone home), there are a handful of people who simply want independence because they’ve watched Braveheart a few too many times. But hey, the BNP and UKIP want Scotland to remain in the union, so unionists needn’t cast any stones as we have boulders to chuck back. But whatever your reason for wanting Scotland to be independent (I’m a mixture of the first and second reasons, with the third being a happy side-effect), I don’t think anyone actually believes independence will, in and of itself, rid Scotland of all its problems. There may be some who don’t even give it a thought, where independence is not about solving those problems (mainly your Wallace worshippers I alluded to in the previous paragraph) and to whom independence is indeed an instant cure to the only problem they’re trying to solve; but those who DO want independence for more social-minded reasons realise independence is just the beginning of the work to be done. However, in light of Johann Lamont’s now-infamous speech where she made Scottish Labour jump aboard the “let’s cut our way out of recession” train just as it is about to go over a cliff, we now have absolute concrete proof that there are people for whom remaining in the union IS a panacea. I say this because it is the only explanation for people such as Lamont. If we take her premise as being true – that the current balance of public funding and public spending in Scotland is unsustainable and something must change – then there are two solutions: increase funding, or cut spending. That’s not a false dichotomy, for the equation has only two variables. Forgive me now for regressing to the mathematical background that served me so well at school, but the Public Services Equation goes like this: F – S = X, where F is public funding, S is public spending, and X is the amount leftover (which, in the case of most national governments, is a negative number). You adjust F and S as necessary to achieve the desired result for X. However, in terms of the Scottish block grant, X can only be the constant 0 (unless you’re a Labour/Lib Dem coalition and you decide you want to hand money back to Westminster). Therefore, the equation simply becomes F – S = 0, or F = S. As I say, two variables – you either put them both up, or you put them both down. By declaring her intention to start a “debate” around public service cuts, Lamont has already conceded that the public funding part of the equation cannot be increased. Rather than start a debate about whether we want to cut spending or increase funding and then look at how we might achieve whichever option we decide on, she has already conceded the first argument. She has no interest in talking about how we can raise taxes (other than a hint towards raising council tax, with a cowardly refusal to actually admit if this is what she is suggesting, as was witnessed when she was allowed out for a rare foray on TV – which instantly reminded us why the Labour party machine usually keeps her hidden), because to do so would mean admitting that independence is something that is at least worth looking at – a bit like a creationist saying “well, I SUPPOSE you might have a point about dinosaurs being completely absent from the bible…” But no, Lamont simply refuses to even acknowledge the existence of the option to get more tax powers, whether that is independence, full fiscal autonomy, or something else. She is saying that Scots must put all our eggs in the union’s basket. This, for her, is our only option. For Johann, and others like her, no matter what the question is, the union is the answer. Whatever problems we may have, they can all be solved as long as we remain in the union. Don’t want spending cuts? Well, as long as we stay in the union, and help elect a Labour Westminster government, everything will magically resolve itself (despite it not happening during their last 13 years in charge, and the current bunch’s refusal to say they will roll back NHS deforms or top-rate tax cuts). Fed up of a broken electoral system and an upper chamber which practically writes a hierarchical class system into the (unwritten) constitution? Well, stick with the union buddo! One day they’ll reform it (although you can’t even rely on the unlikely event of a Lib Dem majority now.) Don’t like troops being sent out into illegal wars? Stick with the union, the UK hates illegal wars. Honest. You want Trident removed from Scottish soil/waters? Well, rather than going with those evil separatists who say there’s a massive majority in Scotland for such a policy, you’re better off staying with the union, and one day – surely – we’ll remove it. After all, pledging billions towards a replacement in NO WAY precludes any future UK government from simply ditching it. Yes folks, whatever your question, the union is the answer. And that, my friends, is why it is unionists like Lamont who think their choice is the panacea to all our ills – not people seeking independence. Good article, Doug. From what I heard on the news tonight, we can expect more neo-liberalism from Labour UK. It looks like the English can look forward to a semi-privatised health service, no matter which government they elect, as Mr Miliband has no intention of rolling back the Tories’ reforms. So Mrs Lamont’s speech was very much in line with what head office is preaching for the rest of the UK. A future Labour government in Scotland might go down the same route. That’s a truly frightening thought, and not in line with any kind of Scotland I imagine for the future. It was stunning that Mrs Lamont’s speech didn’t mention even once the massive savings that could be made by not going to war at the beck and call of the USA, and/or not retaining and replacing the Trident weapons system which we only own in name, but in reality is the property of the USA controlled entirely by them, and which in any case is utterly useless against any kind of potential enemy we will have in the future, but give the UK government world leader status. Someone said that in an interview afterwards (maybe with Bernard Ponsonby) she was obliged to admit to supporting the retention and replacement of these WMDs, and taking London Labour’s line on all things military. Who would have imagined this day? At the moment Labour are well ahead in the polls in the UK because they are not the Tories. I wonder what the public will feel when they discover that they ARE the Tories, with a slightly younger, slightly slimmer, slightly less posh, and actually slightly less popular leader. I suspect the interview you’re referring to is the one on Scotland Tonight, where John MacKay really took her to task, and when he said he was going to ask her about something that a lot of viewers had contacted them about online, my Twitter stream went into overdrive as he dropped the T-bomb: Trident. She ummed and ahhed, but MacKay refused to let it drop, and finally she was forced to admit that, despite her protestations that she is against nuclear weapons, she did not support the idea of the UK getting rid of Trident. It’s really quite insulting that Labour think this woman deserves to lead Scotland. She couldn’t lead a unionist march through Glasgow. We are presently going through the phase of the media trying to persuade us that Lamont is just the very thing. They tried the same with Gray -and McConnell and McLeish and Alexander – but I would judge these were all more able politically and more personable than Lamont is. McLeish in particular is patently a well intentioned and decent man but they all had one huge debilitating weakness – they are trying to save a lost cause. They can’t – and a lost cause cannot accomodate a good and able leader. If he makes that small leap, and becomes the first current high-profile Labour member to join Labour For Indy, he could trigger an avalanche. As for Dugdale, before she was elected, fellow bloggers insisted that she was one to watch. She hasn’t been. She’s been every bit as partisan as her former employer, the merry Lord of Cumnock, with her TV appearances being particularly unpleasant (although Gordon Brewer treated her with hilarious contempt the last time she was on Newsnicht), and she has picked (or been given) some truly dire angles of attack. It would be no great loss if she was next to get the poisoned chalice.